The incredible profit making model in video games is called “microtransactions”. And it has become the new standard for making massive amounts of money from video games. Traditionally, video game developers took on the sunk costs of developing, marketing, and publishing video game titles. Once the video game was published, they would rely on sales of the game in order to make their money back. However, in the past few years, the rise of microtransactions has completely changed how video game developers approach game design. Under the old model, let’s say there was a video game – Grand Theft Auto, for example – that you wanted to play. You would head down to your local game store, pay them $60, and you would get your copy of the game. You would then play it until you were bored of it. You’d then sell it back to your game store, lend it to your friends, or let it collect dust. Either way, the publishers of the game had already taken your money and were done with you. Microtransactions have trumped that revenue model. Nowadays, you can still buy Grand Theft Auto, but the game itself will come with its own online shop. In this online shop, you’ll be able to find in-game items that you might not be able to get from just playing the game itself – cool cars, fancy guns and new “skins”. These are all virtual, of course. And all with a real-money price tag attached. To see what a big deal this is, in the chart below look at how microtransactions (in dark blue) are outpacing traditional game sales. To many of us, the idea is ridiculous. “Why pay money for virtual items? They aren’t even real! Yet as you can see from the chart above, the revenue share of microtransactions in video games has far outstripped that of the traditional models. 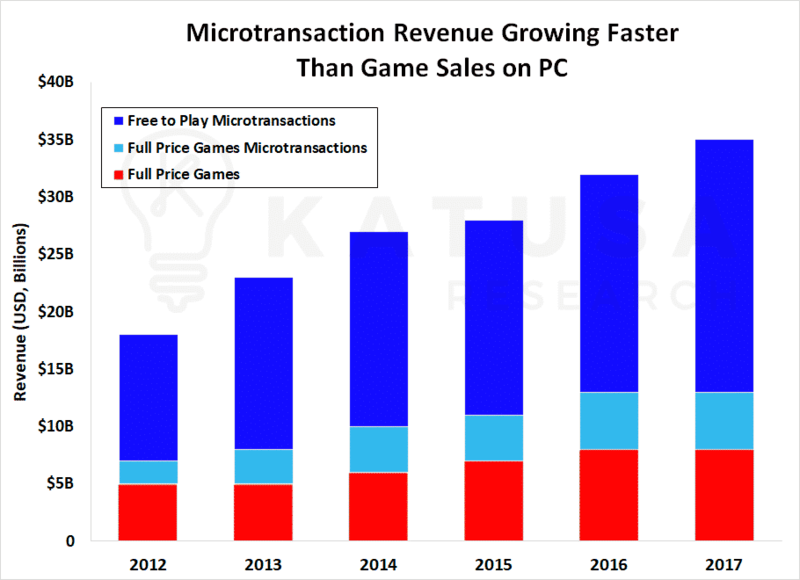 It generated over three times as much cash on the PC platform last year as actual game sales did. Even for larger gaming companies, which originally relied on the traditional model of revenue generation, the revenue shift has been steady. With their Xbox Live Marketplace, Microsoft was the pioneer in this monetization model. Since then, mobile games have helped turn microtransactions into a widespread social norm, particularly with the plethora of popular free-to-play, or “F2P,” games. Pokémon Go, Angry Birds, Candy Crush, and Clash of Clans are just a few of the more well-known examples of games that have made money off of the growth of millennials and their ever-present cellphones. sions in the publications. Katusa Research and the respective authors do not guarantee that the expected profits or mentioned share prices will be achieved.